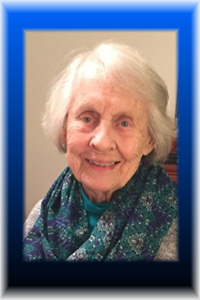 Gladys Irwin Pearce, age 97, of Louisville, KY., passed away Tuesday, January 29, 2019. She was born on July 18,1921 in Crestwood, KY. She is preceded in death by her husband of 67 years, David Kenneth Pearce; and her four siblings, Julia Powers, Jack Irwin, Amelia Irwin and George Irwin. Mrs. Pearce is survived by her loving daughters, Sherilyn Reddersen (Jay) and Cynthia Parobek; grandchildren, Thomas Parobek (Marli), Brian Reddersen (Lindsey), Julia Parobek, Scott Reddersen (Michelle) and Melanie Alvey (John); six great-grandchildren; and a host of relatives and friends. Visitation will be from 2:00 pm until the time of the funeral service at 3:00 pm on Friday, February 15, 2019 at Duncan Memorial Chapel, 5600 Old Floydsburg Rd, Crestwood, KY 40014. Burial will follow in Floydsburg Cemetery. In lieu of flowers, the family requests that contributions be made in Gladys’ memory to Southeast Christian Church, earmarked for Sew Blessed Ministry (920 Blankenbaker Pkwy. Louisville, KY 40243). Add your memories to the guest book of Gladys Pearce. Gladys and Dave were dear friends of my parents, Bob and Vi McMakin. your dear mom. Pat and I have fond memories of her and of your dad. Sending hugs and prayers.